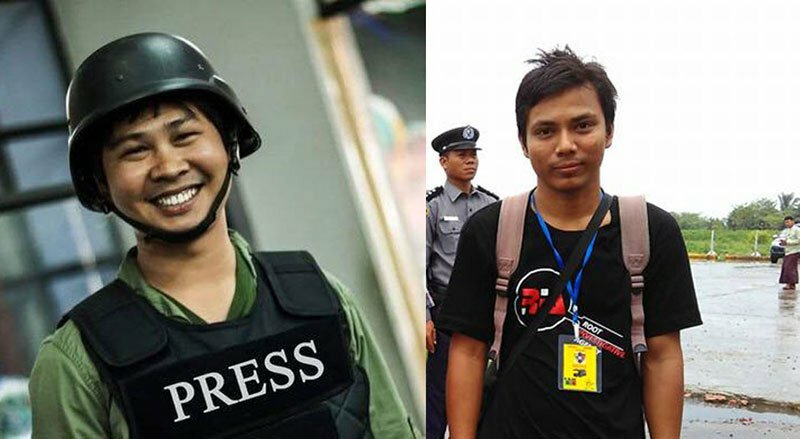 Mizzima Media Group is calling for the immediate release of two Reuters news agency journalists who were arrested this week for allegedly violating Myanmar’s Official Secrets Act. They are facing up to 14 years in prison under the Official Secrets Act. The arrests are an attempt to intimidate journalists who are attempting to do their job of investigating and reporting the news under difficult circumstances. From our understanding, no detail has been provided about the supposed ‘security documents’ or the mysterious ‘foreign agencies’, Mizzima Editorial said. To add insult to injury, the authorities provided a photo accompanying the government’s statement showing the two journalists standing handcuffed behind a table covered with documents, an image designed to suggest the assumption of guilt. The coming to power of a civilian government led by State Counsellor Aung San Suu Kyi raised hopes of a significant improvement in respect for media freedom. This case, one of several cases involving journalists, may severely damage the reputation of the government at a time when it is already facing severe criticism at home and abroad over its handling of the Rakhine crisis. Mizzima believes that reporters have the right to visit sources of news and also the right to collect and question facts relating to such news for the sake of presenting accurate and correct stories. The Myanmar authorities have barred or severely restricted reporters from visiting the troubled northern region of Rakhine State, making it hard to obtain accurate information of developments. Journalists typically assume it their duty to collect information and investigate to attempt to provide a fair and balanced account of developments. In this case, though we accept some of the facts collected should not be disseminated into the public domain as they might threaten state security, accusing these reporters of violating the Myanmar Official Secrets Act is a threat to the freedom of press, and a misuse of an archaic law enacted in 1923 by British colonial authorities, with the intention of suppressing and oppressing their subjects. We are concerned about the alleged denial of access to the detained reporters by family members and worried about the violation of their fundamental rights. We call on the government to explain this incident with full transparency and release these detained reporters as soon as possible.